For this first project I used the large scallop stitched die from the new Stitched Borders 2 dies. and created a goodie bag, since lots of the holidays are coming up, just want to use these dies and extend the usability of them. I used the 12 x 4 3/4 white cardstock to create this project. Before adhering the goodie bag together, I first decorate the front of the goodie bag using the Wplus9 Pretty Peonies stamp set. To begin, I die-cut both ends of the 12 x 4 3/4 white cardstock really close to the tip from top-to-bottom using the large scallop stitched die from Stitched Borders 2 dies. You might need to do this few times to get your desired measurement. I then scored the middle 1 inches to create the fold. 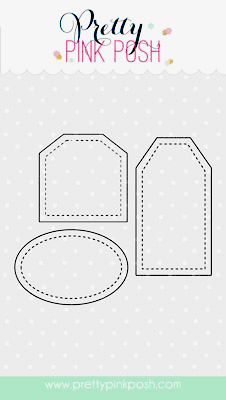 I also die-cut the top and bottom potion using the oval stitched die from the Stitched Tags dies to create the handle for the goodie bag. I also cut a 3 x 3 inches of white cardstock and scored the middle to adhere on the sides of the bag, this will help me secure the goodies that I will put inside to avoid from falling. Here's the view just to show you I adhered the 3 x 3 inches of white cardstock on both sides of the goodie bag. Make sure the bottom of the 3 x 3 is close to the score fold on the goodie bag to avoid gaps. Next, I adhered the stamped flower die from Wplus9 Pretty Peonies to one of the Stitched Tags dies . Then clip the handle of the goodie bag with a clothe's pin and added some Sand sequins 4mm & 6mm from Pretty Pink Posh to finish off the bag. For my second project I created a card to go with the goodie bag using the new Stitched Borders 2 dies. I used the stitched straight line die and the elegant scallop stitched die. First I stamped the images at the bottom of the card base using the Wplus9 Pretty Peonies stamp set to match the goodie bag. I then die-cut a strip of white and kraft cardstock using the elegant scallop stitched die from the new Stitched Borders 2 dies and adhered on the top of the card base. 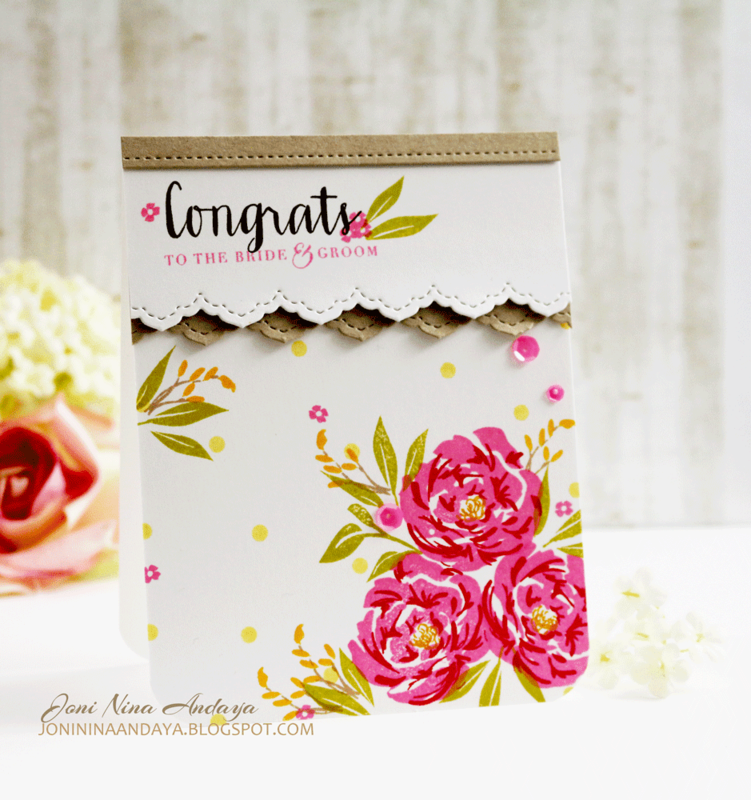 Next I stamped the sentiment "Congrats" using the Wplus9 Strictly Sentiments 5 stamp set. I also used another sentiment "to the bride & groom" from Wplus9 Fresh Cut Wreaths stamp set. Next, I added the die-cut stitched straight line on top of the card for balance. Then added some Pretty Pink Posh sequins in Pink Peonies 4mm & 6mm to finish off the card. For my third and last project, I used the negative of the Stitched Tags dies to create a window for these cute little people from Mama Elephant In My Heart stamp set. These tags are just the perfect size. I also used the stitched straight line die from the Stitched Borders 2 dies and adhere the strip on the top and bottom of the card. In this view I just want to show you the dimension of the card panel. The little people is also adhered with dimensional foam tape as well as the window panel. To create the backing of the card window, I first drew pencil lines using the window panel as a guide. I then cover each shape with post-it pad one at a time. 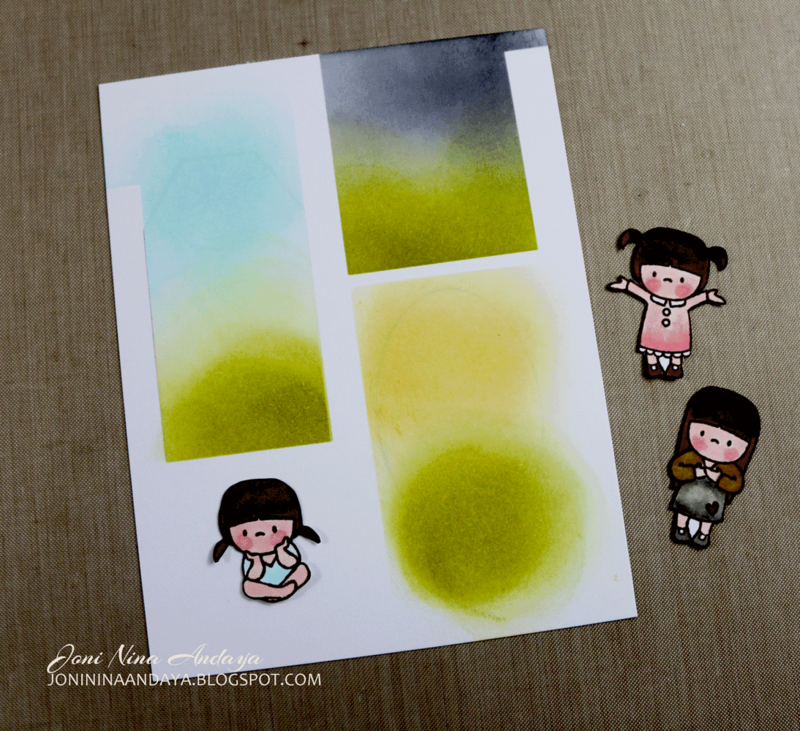 I distress each shape with 2 colors of distress ink pad to make the color pop more. Once the distress is done, I erased the pencil marks with an eraser for a cleaner look. Next, I stamped more image from Mama Elephant In My Heart stamp set, including the butterfly and the star. But before I assemble, I adhere the strip of kraft on top and the bottom of the card panel window and stamped the sentiments from Wplus9 "Hugs and Kisses" from Valentine Wishes stamp set and "I Miss You" from Hand Lettered Hello stamp set. Couldn't help but add more Sparkling Clear sequins from Pretty Pink Posh in all 3 sizes to finish off the card. 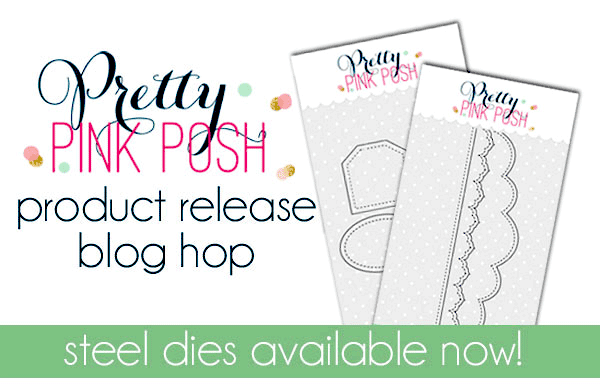 I hope you guys enjoyed these Pretty Pink Posh products. GIVEAWAY ALERT: There are 2 $25 Gift Certificates up for grabs. Winners will be picked randomly along the blog hop, Don't forget to visit each hop to increase your chances to win. Comments must be left by 11:59pm PDT on 10/12/2014. Winners will be announced on the Pretty Pink Posh Blog. We have more inspirations for you from the Design Team and the Guest Designers. But for now your next stop is to Maureen Merritt 's blog. Thank you so much for stopping by <3. I love, love, love your gift bag/card set! You've been busy Joni. Your bag is super clever and the first card is gorgeous. And your last card is so cute. I love the variety backgrounds. Amazing inspiration, Joni! LOVE all of these. 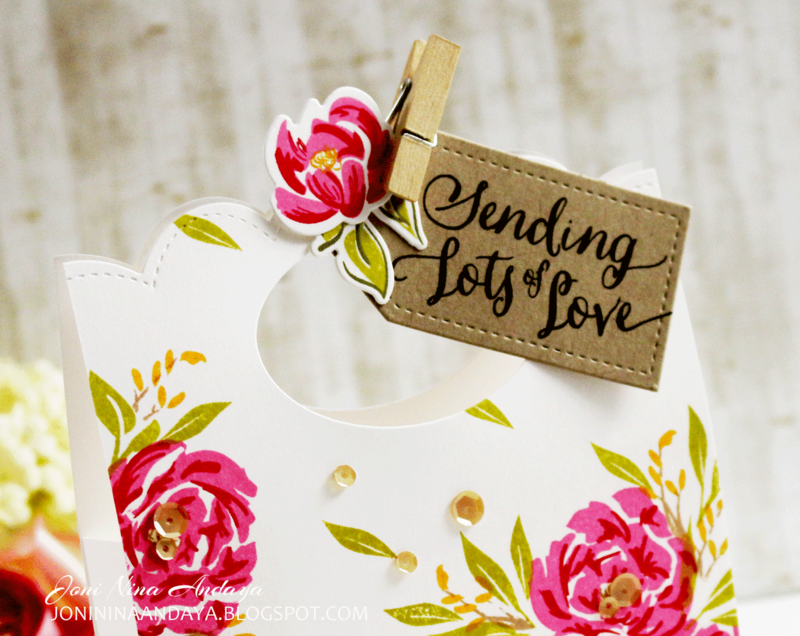 GORGEOUS bag and cards! Those peonies are LOVELY!!! 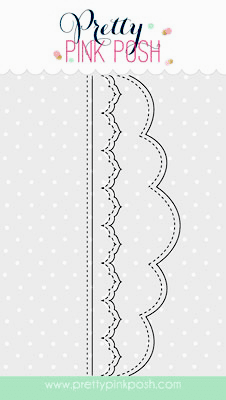 That fancy scalloped border die looks like it was made for you!! It matches your style so well!! Love how you used the tags on your card! Oh I am a big fan of yours. these projects are amazing! How lovely are all three of your projects? I adore your last card, it is so unique and pretty! Beautiful cards Joni. Love the sweet box with the pretty flowers and the card. The scallop border looks great. What a fun way of using the tags as the windows. Fantastic designs. Wow...super creative to make a gift bag. And I adore your last card using the tags as little window cutouts!! Brilliant. 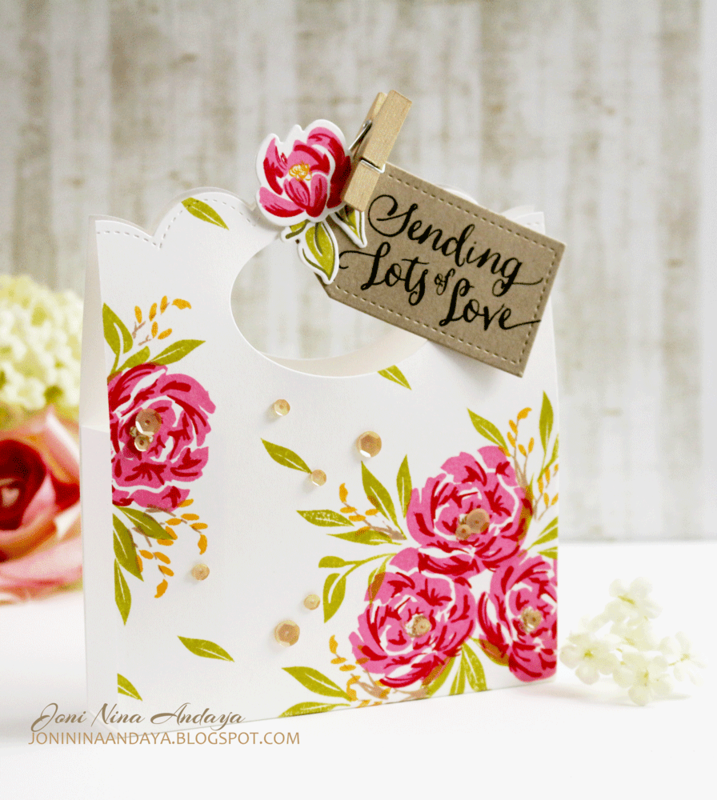 I love the very prett bag you made with the pretty peonies and the scalloped border die. Just beautiful for a wedding favor! Precious, love the goodie bags. Might have to try to make one for my grandson for Halloween. Thanks for sharing! Clever and creative projects today, Joni! Love these new products by PPP! AHmazing to quote Kathy. Your cards are fantastic and so creative. Gorgeous!! Oh my, all of your projects are absolutely amazing! Love how you used the PPP die for the goodie bag, so cute!! What beautiful projects. I just love the stitched border and tag dies. Oh, these are all fantastic, Joni! Fabulous job with the new dies! What a super use of these rocking new die set, all the 3 creations are stunning!!! Love the idea of gift bag and negative use of die:) Inspired me a lot!!! Oh you clever girl! I'm just smitten here Joni! Clever little bag with a matching card? So beautiful - bright color and sparkly accents! YUMMMM!!! 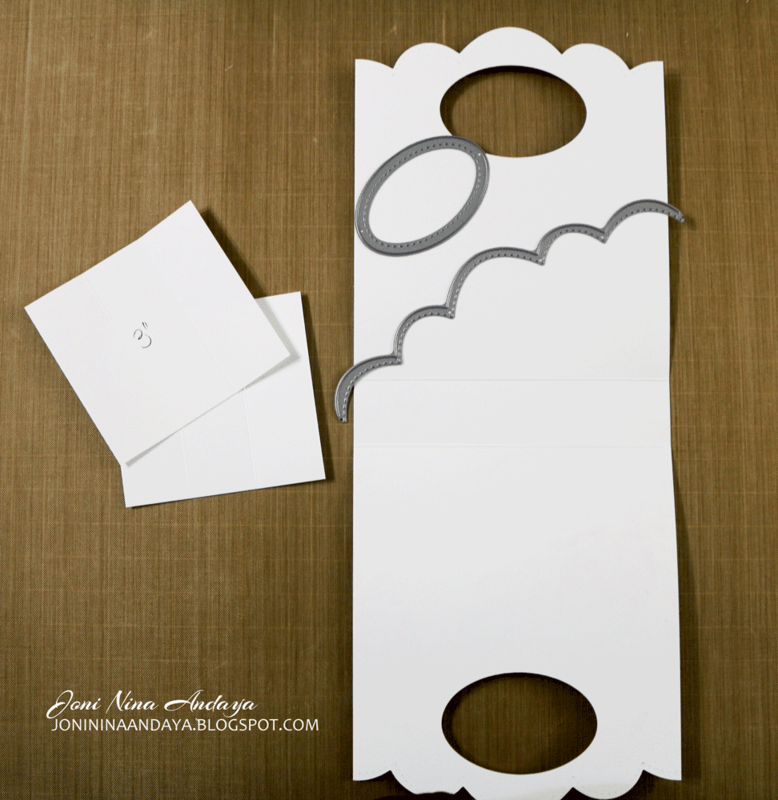 And how cute the last - smart way to get all three tags on one card and it looks AMAZING! I absolutely love our box and cards!!! Love Love Love! Love, Love, Love the floral card!!! I love those dies! The dashed lines are just perfect. The card with the little girls is so cute! I love your idea with the goodie bag too! Beautiful Joni, love the sweet gift box!! Love your creative and beautiful gift bag! WOW! A fabulous new release of PPP products that showcase your incredible ability to work magic with whatever you touch! A trio of stunning amazing-ness, Joni! Inspired and inspiring! All of your PPP projects are wonderful--loved how you used the dies. I love this post. Your projects are so stunning. Oh man, these projects just knock it out of the park, especially the gift bag and matching tag! TFS!!! I have wanted a die that makes bags for awhile now. Never thought about creating my own with a boarder die. 1st time visitor here and want to say "All your projects are sweet.". Wow! Your work is outstanding!! This is my first time to visit. I'll be back! Wow - you are so creative with the stitched edge dies. I love them all! I love that large scallop die!! Your floral card is beautiful! You did an amazing job showcasing these fantastic new dies! Wow! Fabulous projects! You really did an awesome job of showcasing the versatility of these new PPP products! 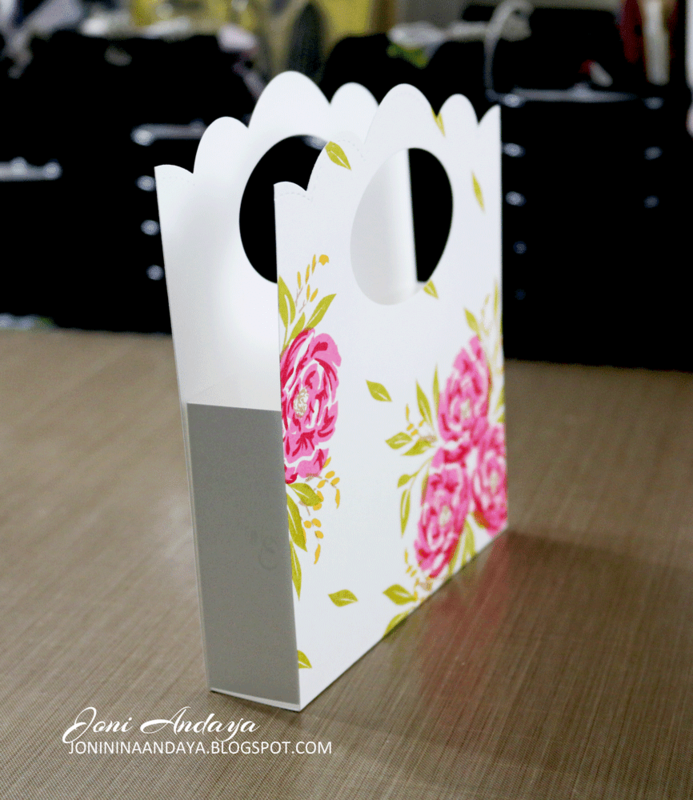 Your little gift bag is stunning! I love all the details and how elegant it is! fab cards, and you sure know how to use that ink--just beautiful! Beautiful goodie bag and matching card. Your "window" card is just adorable. Thank you for sharing with us. Wow! I am totally impressed with how you used the dies so uniquely, the negative space and making a goody bag. Love it all! So many beautiful projects by using the new dies! Awesomeness love the great new release items! Looking forward to trying some out thanks for the chance to win! God bless! Such beautiful cards. The gift bag would be great for a wedding shower! You are a creative genius - loved all your projects! How clever is the gift bag and the cards!!! I really like the stitchings along the borders of the dies; it adds so much to the details. Simply gorgeous! I love...love..love all your projects with Paulina's new goodies! Wow factor goin on! 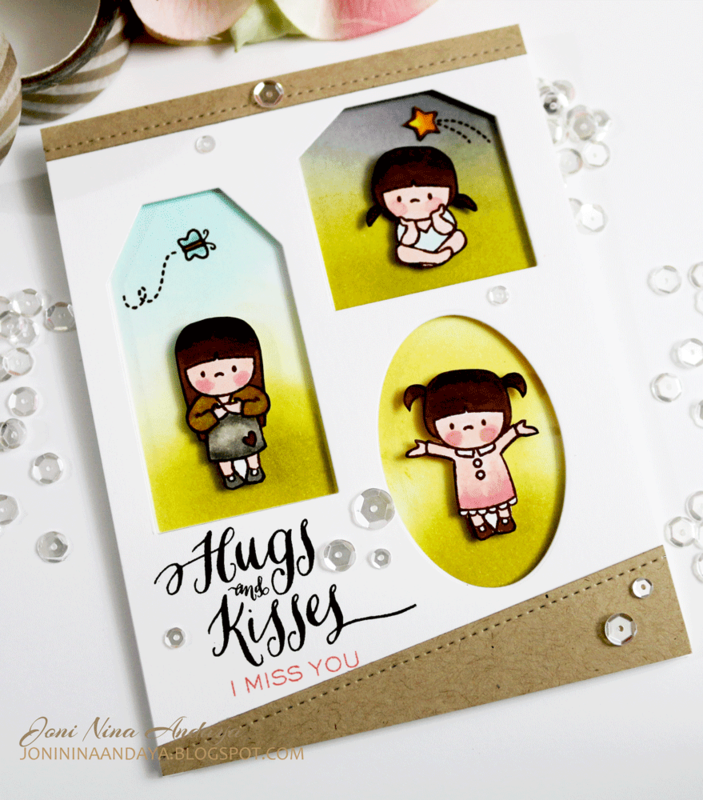 OMG, that hugs & kisses card is too adorable!!! Wow your projects are stunning! Especially love the congrats card using pretty peonies. I also love how you used the tags as windows for the 3 cute images. Thanks for sharing. Gorgeous projects! Amazing work ! Fantabulous! What wonderful and beautiful projects! Beautiful cards! Love the first one especially! First, what beautiful packaging!! Second, clever use of the negative space of the dies! omg! your cards and crafts are AMAZING! I love them all. You are so talented! Love both projects. I am so totally going to CASE your tag window card. So cute! I love the elegance of the floral card. Perfect with the stitched scallops. So loved the cards and treat box. Amazing! The bag/tag/card combo is so pretty!!! Love to do a whole matching set like that! beautiful projects - such amazing talent. Love the Hugs and kisses card. Those kids are too cute! Wow that is a gorgeous gift bag and card. I love the creative ways you used the dies. Beautiful ideas! I especially love your treat box! You are thinking outside of that box , love using the dies to make frames for the little girls..
Love Your goodie bag and card. 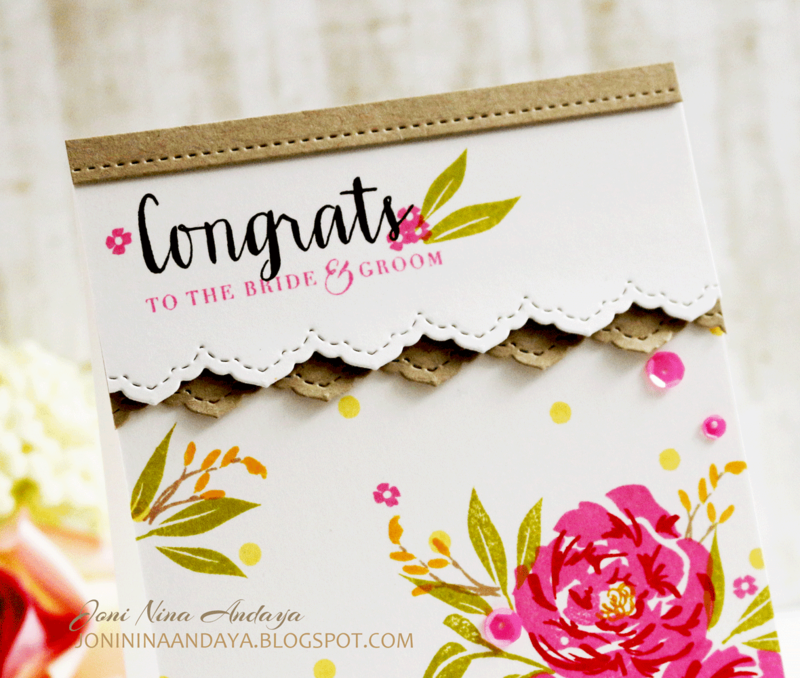 cute cards...really like the scalloped edge. Super cute bag and love the little gals on the card!! Adorable! Such a pretty bag! I love the different cards and thanks for explaining how you did the background on the last. I already want more of the sequins and now this!! Your card and gift bag ideas are amazing. The gift bag and the matching card are just amazing and gorgeous. The little guys card is fun, too! All these projects are so amazing!! Love the colors especially. I must have those dies so I can try & re-create these gorgeous projects. Thanks so much for sharing! Wow this is gorgeous!!! The bag the cards! Just amazing! That bag is so pretty, and the card is just adorable and brilliant! Very pretty gift set and I like the windows for the cute little girls. O, Joni! Loving both your pieces. When I saw the box I thought it was made withh designer paper until I read that you used that gorgeous W Plus 9 stamp set. I am so casing your business girl! I love the goodie bag..so pretty and love the cards!!! The distressed backgrounds are the best! Such pretty cards and gift bag! Thanks so much for sharing. I loved all 3 projects/cards but I have to say that my super fave of the 3 was the Mama Elephant image card... LOVE the images and the whole composition is ADORABLE! Thanks for sharing your talent with us. Darling projects...love the new dies. Wow! Love the cards and that goodie bag is gorgeous - thank you for the tutorial! I'm so looking forward to these dies! Great goodie bag and cards! the last one is too darned cute! Loved all of your creations. The bag with matching card was so pretty (Love the peonies stamp) and your window card was the cutest thing ever! I like how you think outside of the box, great ideas and projects! Loved what you did with the third card! What a creative way to use the Stitched Border Dies 2 and Stitched Tag Dies...I need to purchase these dies! Your first two projects were beautiful and your last card was so stinking cute!! 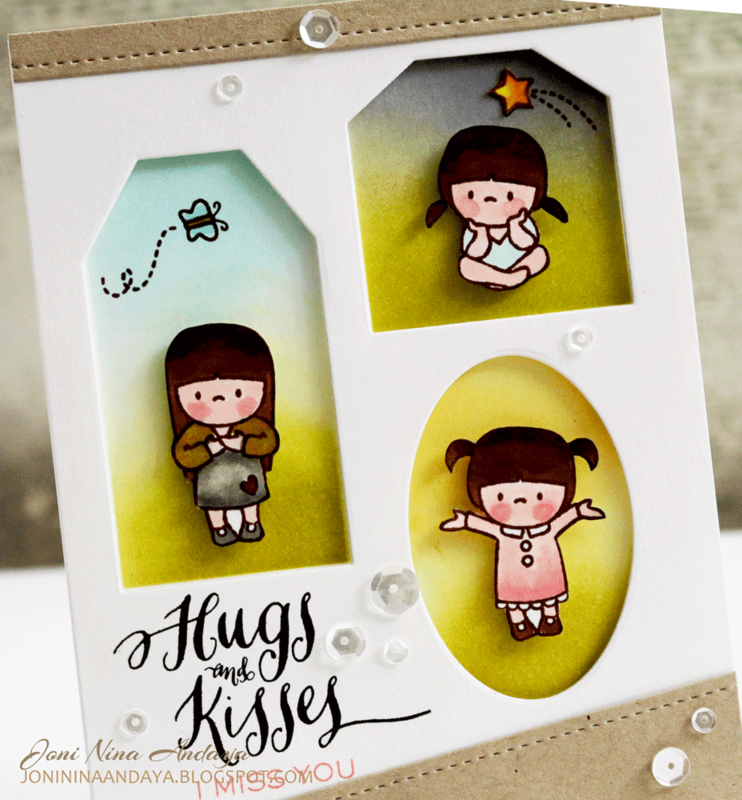 Your Hugs and Kisses card are absolutely adorable!! I love these new dies. Oh my goodness you came up with some very creative idea! Love your projects Joni! All of your cards are great. I love the goodie bag too.. Very lovely goodie bag and card. The last card is so sweet with the little girls. Thanks for sharing. I love the little bag. Perfect for a wedding and then your card is so cute. Very creative. Great products and great projects. What a beautiful cards and goodie bag! I would never have thought of that template on my own but it looks so easy so thank you for sharing! I love how fast and easy these little boxes can be made. The card with the little girls in the cut-outs is darling. I like those kind of cards - you can use several stamps on the front of one card. thanks for sharing some beautiful things. Oh my goodness, I love your pretty floral bag and card! I also love how you used the tag negatives to frame each little child. So cute! I love the idea of using the small tags as windows! Great ideas. Fun, fun treat bags! The second one is a perfect wedding gift bag. Wow, Paulina certainly picked amazing designers to showcase her new products. Your designs are incredible and so original. Love the treat bag and the card using those small dies is genius. Thank you so much for the inspiration!! Thank you for your fabulous and beautiful ideas! You really inspire me! Really like how you used so many of the new dies in unique ways! I love the tag window card. Great idea and beautiful cards and gift bag! Those stitched dies are much more versatile than I thought. Thanks for the great project ideas! Beautiful cards!! I love the way you layered the borders on the "bride and groom" card. Loving your cards & goodie bag! So pretty!! Love that goodie bag that you created! Super cool! SO MUCH TO LOVE Joni!!! Your wedding card is DELIGHTFUL and your "missing you" card SUPER CUTE with the sweet stamps in each window!!! Darling goodie bag and card! Awesome use of these fun dies! Such a great idea using the negatives of the dies. And your window card is so cute. Awesome projects using the new stitched dies from PPP. Thanks! Joni, I love love love your bag and cards! The window card with cute girl is so adorable! Thanks for the tutorial how to make the pretty bag! Wow, Joni, you're not letting any moss grow under your feet! Love that coordinating gift bag & card--the colors especially are just so pretty. And that last card with the little Mama Elephant kids is adorable. I've had that set for a while, and just have never gotten it inky. You've kind of inspired me to pull it out and see what I can do with it. Tfs! WOW Joni, awesome cards and LOVE the bag! !